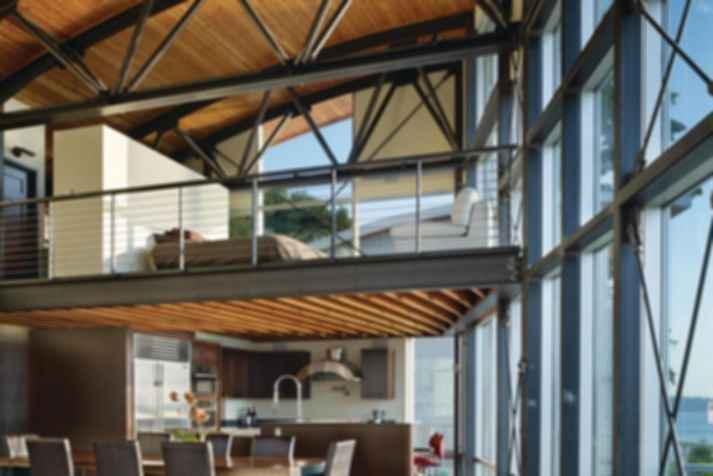 An emerging construction design trend deviating from the conventional methods, space frame technology marries the three pillars of architecture - utilitas (function), firmitas (structural) and venustas (aesthetics). Known for its lightweight structure, the spatial unit of a tetrahedron forms geometric pattern interlocked with rigid joints. Being very structurally sound, the three-dimensional space frame technology distributes the load only to axial tension and compression, making the torsional moment or bending irrelevant. With its application ranging from medium to long-spans making interior load-bearing support insignificant, to complicated curvatures and parametric hyperbolic paraboloid shells, this construction system is now a staple in modern architecture visibly shown on football stadiums, sports complexes, swimming pools, multi-use pavilions, railways and airports. Its economic consideration adds up to its simplistic appeal as the raw and exposed overhead utility lines are embraced along its spans rather than accumulating expenses on ceiling materials, installation and maintenance. Composed of two components, the members and joints form the structural integrity of the space frame. Members are axial elements with circular or rectangular sections resisting tension and compression, while the connecting joints are critical to the strength, stiffness and safety of the design. Usually made of steel or aluminum contributing to its lightweight structure, the spherical nodes or square hollow sections at the center provide threaded drilled holes for the insertion of members in different directions of their axis. Consequently, the structural tube and welded steel cone of the member on each end are tightened into the spherical node or square hollow ensemble through screws and nuts. Different types of space frame connection include welded, bolted and threaded. Chief issue in the structural joint design is the consideration of a truly rigid connection that can support a load. Welded joint can be achieved through processes like stick welding, metal inert gas, tungsten inert gas and spot welding. For bolted connections, techniques include ordinary bolting (dowel action), turned and fitted bolts, and high strength friction grip (HSFG) bolts. Threaded connection includes the famous spherical MERO system. Also, grid layers of space frame technology comprises of single, double or triple layers. Structural adequacy, functionality and aesthetic requirements are factors taken into consideration before proceeding to the structural analysis of space frame. Initially, general form of the building and the space frame type alongside with the construction technology to be used is evaluated for the flexible and custom geometric arrangement of the linear elements connected with nodes. Catering to flat covers or curvatures, the computer-generated geometry itself is critical in the determination of the structure's bearing capacity and weight. Connecting joint design, both functional and aesthetic, is crucial for the structural rigidity of the space frame. Design requirements include easy fabrication without recourse to advanced technology, minimum joint eccentricity with necessary tolerances, effective maintenance, mass production, support point flexibility, and production cost. Connection techniques of jointing systems is divided into three: with a node (sphere, cylinder and disk), without a node and prefabricated units. Such proprietary systems include Mero, Space Deck, Triodetic, Unistrut (Moduspan), Oktaplatte and Nodus. Also, methods of assembly & erection such as scaffold, block assembly and lift-up are catered specifically based on the efficient hoisting requirements of space frame types. What other techniques can be incorporated to maximize the efficiency of space frame technology? What specific problems have you encountered on structural design that space frame technology provided a solution for? Share yours below!